There are many forms of persecution in the world. Depending upon where you live (and whether or not you’re a Christian), you may experience workplace persecution that keeps you from being promoted. You may find yourself shunned due to an ever-increasing liberalism that is opposed to God and Christianity. The type of persecution some Christians experience in the workplace is not the kind that can be proved in a court of law. There is the type of persecution that missionary friends of ours experience in Israel. There, they have routinely seen their home surrounded by orthodox Jews who gather to simply make noise and hurl invective and insult.They do this while a Christian meeting occurs inside the home. They also have to deal with landlords who refuse to fix things that need repair. The red tape in getting the simplest of things done can be burdensome and horrendous. Yet, they stick it out because they believe God has them there for a purpose. Christians who live in other parts of the Middle East or Asia, are in physical danger. Countries under which Sharia Law operates are not countries that tolerate other religions, especially Christianity. On one hand, Muslims will tell you how much they respect Jesus, often adding “peace be upon Him” (PBUH). On the other hand, they see Jesus as subservient to Muhammad and whenever the Bible teaches something they see as an affront to Islam, Islam is accepted and Christianity rejected. This type of environment creates a great deal of tension for Christians going into those countries to work as missionaries. Of course, most of the time, they are not allowed to enter as actual missionaries, so other reasons for entering the country must be given. Missionary work in these countries is done covertly, just as it was in the first century of the Church under Nero, where severe persecution tended to push the Church underground and into the catacombs. But what about people born and raised in those countries as Muslims who, at some point in their life, become Christian? What happens to them? Judgment is often very swift and severe. Ask Asia Bibi of Pakistan. A mother of five who became a Christian was jailed seven years ago on charges of “blasphemy.” She faces a death sentence and will have to wait a bit longer to learn of her fate. For Muslims who become Christians, living in countries ruled by Sharia Law, the penalties are often very severe, including public caning/beatings, prison, and/or death. Blasphemy is a very serious offense in these countries. Bibi is the only woman in Pakistan to ever be sentenced to death for the crime of blasphemy. Her ultimate fate is yet to be decided. But what about countries of Asia? How do these countries deal with Christians and Christianity? Of course, it depends upon the country. Some, like Japan, are more open to allowing Christian missionaries into their country while keeping Muslims out. Other countries, like China, have placed difficult demands and restrictions on Christians and it is getting worse. In an article titled, “Red Tape: China Wants to Constrict Christian Activities with 26 New Rules,” it would appear that the government of China is going the extra mile to make things even more difficult for Christians in that nation. A friend who attends our church travels to parts of Asia, including China every year. He recently noted that one of the pastors of a Christian church there in China is called into the local police station every day. This type of harassment is the norm, where liberty is always kept in check. The one main organization in China overseeing religious groups and activities is called “State Administration for Religious Affairs (SARA).” They have recently drawn up 26 new restrictions they want applied throughout China. Interestingly enough, the new set of drafted laws begins by clearly stating that all citizens of China are allowed to believe whatever they want to believe. However, restrictions will apply as to how those beliefs can be exhibited publicly and even privately. In essence, the new restrictions are designed to eliminate home-based churches or Christian gatherings. No religious activities not approved by SARA. No one may provide a venue for religious services not approved by SARA. No one may use their home for religious practices not approved by SARA (including home or family Bible studies). No foreign or domestic donations may be made to any religious organization not approved by SARA. No one may call themselves a pastor without approval of SARA. No international religious exchanges may happen without approval of SARA. No one may study theology at school without approval of SARA. While you’re allowed to believe what you want in China, you really cannot live your faith openly. In essence, everything needs to be approved by SARA. It is not difficult to imagine that Christians breaking these laws would easily find themselves in prison, doing hard labor. The tragedy is that whenever the government of any nation gets involved in attempting to dial back religious freedom, it results in a form of persecution. Even some of our own politicians in America have publicly stated that Christians need to change their opinion with respect to certain viewpoints like abortion, as a for instance. Yet, this same person has talked about her Methodist roots and how much the Bible means to her. One can only wonder which Bible she refers to because God’s Word is very clear on murder. Then again, this same seems to hold the U.S. Constitution in greater authority when stating that until a child is physically born, it is not a person. AGI noted the report by Caritas Italiana published in the daily newspaper of the Vatican City, L’ Osservatore Romano, reveals that Christians are facing widespread global persecution, discrimination, and violence at the hands of totalitarian regimes. However, even with all this persecution happening, we are not yet in the Tribulation described by Jesus Himself in His Olivet Discourse of Matthew 24, which does not officially begin until the Antichrist brokers a covenant with Israel and surrounding Arab nations (cf. Daniel 9:27). Obviously, it won’t be like turning on a light switch where things are “all good,” then “terrible” overnight. It will have to gradually segue into terrible times (which is exactly what is happening), but the actual and official start of the Tribulation is signaled by the one event highlighted in Daniel 9:27. From that point onward, things will grow exponentially worse for believers. This world has always been filled with evil. There have always been people who have sought to terrorize and dictate to others. History is filled with dictators and tyrants galore who have initially won the hearts of the people, then quickly turned on them. Christians have always borne the major brunt of these tyrants. What we are seeing throughout the world now is a ramping up of that persecution toward Christians as God gives Satan more leeway to attempt to bring his goals to fruition. 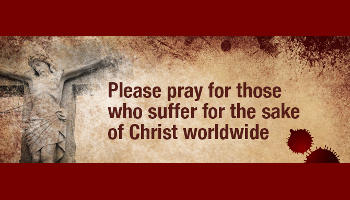 We need to pray for our brothers and sisters throughout the world who are in the Lord. While we naturally want to pray for the cessation of persecution, that does not seem to be a prayer that God will answer based on His revealed will in His Word. What we need to be praying for is that our brothers and sisters in the Lord will remain strong, stalwart, and loyal to the One who gave Himself for them so that their witness will be incontrovertible and that many who are lost will see their testimony in the face of torture and death and will come to realize that these people have committed themselves to God that He would glorify Himself in and through them. Persecution appears to be part of the gathering storm. We are more protected here in America but it is still here to some extent. We need to pray for one another. Entry filed under: Agenda 21, Atheism and religion, christianity, Communism, Cultural Marxism, Demonic, devil worship, Emotional virtue, eternity, Global Elite, ISIS, Islam, Islamofascism, israel, Judaism, Life in America, new age movement, Political Correctness, Politically Correct, Politics, Pretribulational Rapture, Radical Islam, rapture, Religious - Christian - End Times, Religious - Christian - Prophecy, Religious - Christian - Theology, salvation, second coming, Sharia Law. Tags: asia bibi of pakistan, blasphemy, christian persecution, christianity, dhimmitude, global persecution of christians, islam, muhammad, orthodox jews, pakistan, pbuh, peace be upon him, sharia law, suffering for christ.